If you are interested in getting involved in the competitive side of riding at Oxford, then you can trial for one of the two Oxford teams. Oxford competes in the BUCS (British Universities and Colleges Sport) leagues, with the 1st team competing in the Championship and the 2nd team competing in the Trophy at Dressage and Show Jumping, alongside the annual Varsity match against Cambridge. The programme is unique in equestrianism as all riders compete on borrowed horses. This removes a barrier to participation as students do not need to own a horse. In addition, the riders must compete in both dressage and show jumping with the combined scores making up the final result. Teams compete in a series of mini leagues in either the Championship or Trophy with each team hosting one fixture each per season. The winning team from each league automatically qualify for the regional rounds alongside the best two individuals not from the winning team. Six regional rounds are then held and each of the winning teams plus the three best individuals from each event qualifies for the finals. The Championship and Trophy finals take place over three days in June. Teams consist of 4 members, however we will also select reserve team members. 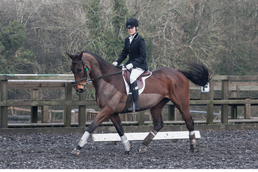 At competitions you will ride a randomly drawn horse for seven minutes before completing a dressage test. You will then ride another horse around a show jumping course and will only be allowed three practice fences before your round. You will be marked against the other people riding the same horse as you. The final scores are then worked out using a standardised penalties system, with team and individual placings being awarded on the day. Trials for the academic year 2014-15 will be taking place in October - please contact our Captain Anna Coenen- Stass nearer the time for more information!